Under brilliant blue skies (despite perfunctory weather warnings) more than 20,000 music lovers gathered together to witness a strong line-up at the festival, which sold out for the first time since 2007. There were the headliners including folk rock giant Richard Thompson (founder of the 60s Fairpoint Convention) who opened Friday night with favourites such as Stuck on a Treadmill and Sally B; Gen X’s dreamboat Rufus Wainwright whose rendition of Leonard Cohen’s Hallelujah and his mother’s (Kate McGarrigle) Working Song were the highlights of a well curated and sharp set; and despite Sinead O’Connor getting distracted by a duck her solo of Streetcars was an instant favourite. Aside from the big names one of the most exciting aspects of such a world music and dance festival were the discovery and musical degustation opportunities on offer. From the high energy complete dance knockout from Spain that were Che Sudaka to the sublime weavings between Gaelic quatrains and contemporary jazz of The Gloaming there was no lack of talent or representation from across a range of places people called home. From Puerto Flamenco (from Seville by way of Melbourne) to Indian songstress Meeta Pundit to the tour-de-force that were Jupiter and Okwess. International audiences were given a chance to appreciate some incredible talent and technique alongside some heart pumping rhythms. While Flavia Coelho’s Brazilian sounds couldn’t have been more different from the bold and brassy tunes from Romania’s Fanfare Ciocarlia both got festival goers dancing immediately. A distinct Kiwi highlight was Estere whose set was sophisticated and classy and Flip Grater and Mel Parsons held their audiences with their own unique styles while Trinity Roots was welcomed back with the launch of their new album. Between the endless options for musical feasting there was also the edible kind with Nova’s Taste of the World Stage as well as an opportunity to borrow a human book from the living library. One of my personal highlights from the festival (especially as the Artists in Conversation series had disappeared) was this intimate gathering of people and storytellers where you could hear on subjects ranging from mortality and life to circus tricks of politics to dealing with substance abuse. A fantastic initiative that actively challenged preconceptions and entrenched misconceptions the human ‘books’ offered their stories as vehicles for sharing glimpses into the multifaceted nature of our humanity. Almost constantly whirring with people booking appointments, these were stimulating sessions that added to the WOMAD experience. As a camper (one of 5000) spending three days at WOMAD is definitely an experience. From the drive down from Auckland to arriving to set up camp (not GLAMPING rest assured) on the outskirts of the racecourse (only to be woken by sound of thudding hooves at 5am) to marvelling at the Taranaki stars and enjoying the wealth of talent and melodies that streamed across the skies as the Brooklands bowl filled with festival goers they formed a series of deep breadths that won’t be forgotten in a hurry. The food with everything available from deep fried paua fritter to crepes and souvlaki were of varying standards but if you had your own kai with you were a happy camper. 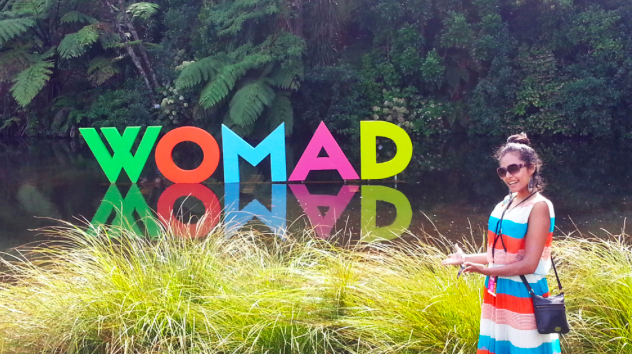 Overall for a newbie to WOMAD I’m sure glad that my first year was 2015 – the bar has certainly been set high.